Creamy Lime Jell-O Salad is an easy addition to any meal. This recipe is part of my learning to cook series so this recipe is perfect if you are just starting cooking. My Learn to Cook series is one of my recipes from my old home economics cookbook from when I was in junior high school. So you know these recipes are very easy to prepare this recipe was one that I made when I was about 13 years old in school. If you have never made a Jell-O salad you are missing out in a great addition to make when preparing a meal. I personally love this Creamy Lime Jell-O salad because you can make this recipe ahead of time. When I started cooking I had a really hard time in trying to get my timing just right. So this recipe is perfect because you can make recipe hours before you are going to serve this. This is also great to bring to a party or even a pot luck dinner. If you can boil water, measure, and stir, you can prepare this recipe. Jell-O salads were very popular in my family’s house. I can remember my Grandmother Eynard always making a Jell-O salad. Now that I am an adult I can see why she liked to prepare them. They are easy to make, they make either a nice salad or even a light dessert. This one contains canned pineapple, cottage cheese, and lime Jell-O. If you like you could even add a teaspoon of horseradish to this recipe if you want to make this dish more savory. When making this Jell-O salad it is important to drain the pineapple and not to just dump it in the Jell-O when mixing this up. You may wonder why you should do it this way, you need to drain it because we want to separate the liquid from the canned fruit so the Jell-O will set up properly. So you can’t just dump it in all at once. If you like you could add a tablespoon of nuts to this salad and it will be good too. 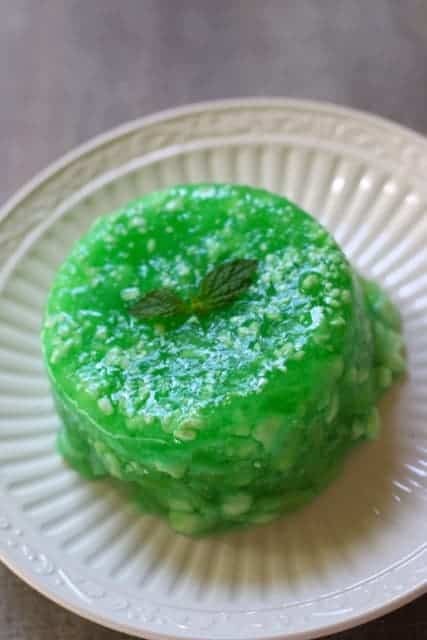 I hope you give this simple Creamy Lime Jell-O Salad a try soon and be sure to check out other Learn to Cook recipes. Love Jell-O? Be sure to try these Jell-O inspired recipes. You can prepare this old-fashioned Creamy Lime Jell-O Salad, it's perfect for a large family gathering. Boil 1 cup of water. Dissolve Jell-O in water. Drain the pineapple, save the juice. Add the pineapple juice to the gelatin, stir until well blended. Add pineapple and cottage cheese and stir in completely. Pour Jell-O into a large mold, or smaller individual molds. Chill until "set". It says to use horseradish ‘if you desire’. If you want to use it, just add it into the mixture, or leave it out completely if you wish. Yes, they should have made that more clear. It sounds interesting, so I m might try it sometime. Do you put the horseradish back in the jar it came from?